UWICS is a club centered around technology, we are fascinated by its uses to do productive and entertaining things such as using drones for photography, automation systems and even video games. We encourage our members to take steps toward using fascinating technology in their everyday life or even contribute to creating new exciting tech. What are some of the activities of UWICS? Activities include sessions where members share their experiences using different technologies throughout their projects such as using the Unity game engine, web design and basic programming skills. There are other events such as our annual Runtime Programming Competition and Project Month which involves groups of our members attempting to incubate some form of software or hardware. Are there enough (local) internship opportunities for Computer Science students? Is this something that the group would be tackling? We don't directly tackle internships but our activities provide people with knowledge and opportunities to work on projects that may give members an advantage in an interview as it will separate students who just go to school and get their work done as opposed to students who actively take an interest in learning new technologies , practice presentation skills and work on mini projects to add to their portfolio. What are the most difficult CS courses are why so? The most difficult CS courses are Data Structures and Design and Analysis of Algorithms. These courses teach the importance of developing efficient code to get the job done. They are difficult because they encourage students to think in a way that they may not have previously had to in order to develop complex algorithms and get a deeper appreciation for problem solving. Another difficult course is Internet Technologies which focuses on web development. This course enforces the skill of learning new web technologies in short time periods and acclimatizes students to the environment of constantly changing methods and techniques of achieving different tasks on a web page. This is an important skill which breaks the mindset of needing to be taught something when there are lots of resources for one to teach oneself, which is necessary in constant web technology environment. What is the difference between the BSc Information Technology and BSc Computer Science degree at UWI? Computer Science more deals with creating software and developing algorithms and IT deals with applying software and hardware tools in real word situations. Is there gender imbalance at UWI for Computer Science students? Yes. I would say there is a gender imbalance as the club consists mostly of male members which is a common phenomenon in the ICT field. For this reason we have had sessions relating to gender diversity and promoted events such as International Girls in ICT Day which is a women only hackathon. 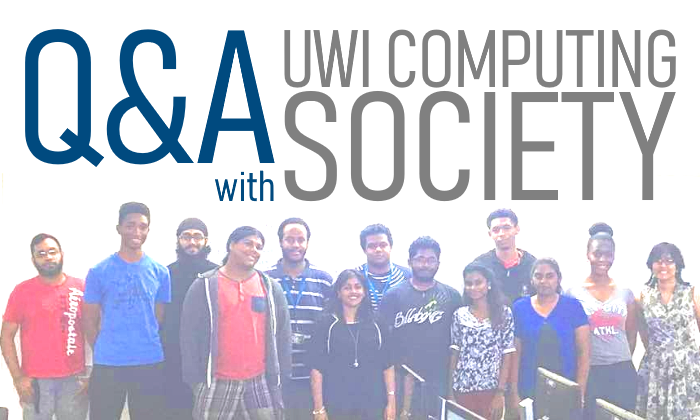 What are the challenges facing Computer Science students at UWI? The biggest challenge faced by Computer Science students is the unsurety of where the market in the economy lies for our skills. Many who are passionate about coding wonder if they will end up in a career that involves developing software or some other sub field related to computing. "Aims to educate its members about the role of computing, information and technology in everyday life." is stated on your fb group, can you expand on this? People in the workplace often talk about social media being a big distraction for their employees and it can be observed that the majority of people are familiar with using technology of this sort. These technologies can be used for productivity rather than distraction as well as other technologies such as simply understanding how web pages work or basic programming knowledge. We try to encourage development of skills that can be useful rather than distracting. Is there enough and good WIFI coverage at UWI and how would the group propose to fix this? In the recent years the WIFI across UWI has been pretty decent. It is not the fastest in the world but it is great for the times when one has work to get done on campus.